Knock Knock Knocking on Cameron’s Door. A normal Wednesday for me usually involves some laundry, some grocery shopping, maybe a walk in the park, and a jigsaw or a game of hide and seek with DorkySon. Yesterday was a little different. I went to Downing Street. 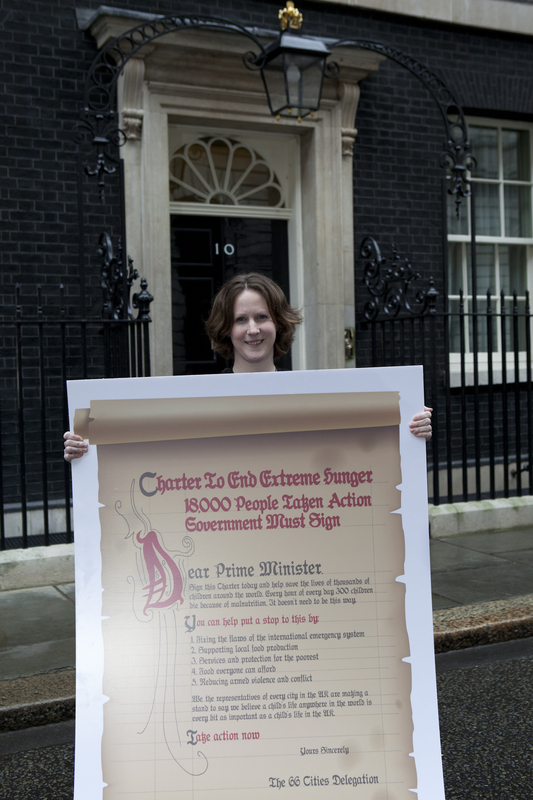 I was one of six Save the Children campaigners who went to hand in a petition calling on David Cameron to sign up to the Charter to End Extreme Hunger. 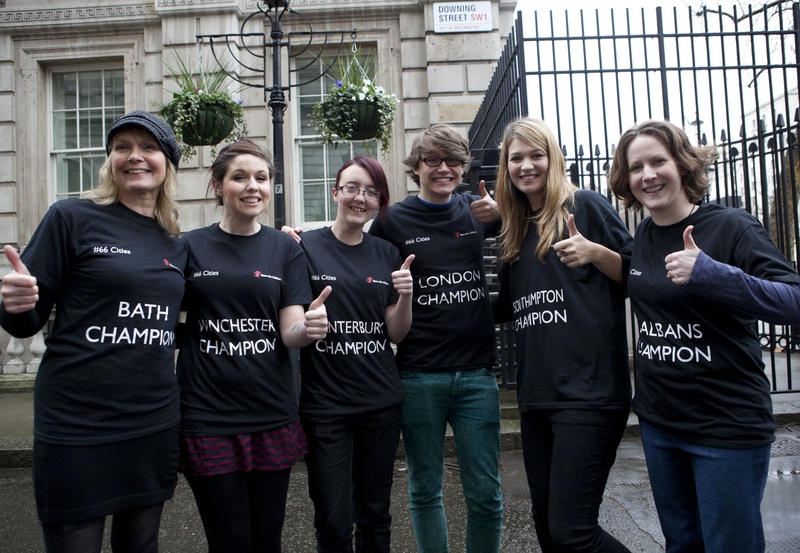 Each of us was representing one of the cities in the 66 Cities campaign – so I got a natty wee t-shirt with ‘St Albans Champion’ emblazoned across the front – but we were also representing the incredible 18,000 people who had signed up to the petition online. DorkyDad took the day off work (thank you! ), and I took a train into London. It was a true role reversal – he stayed at home with DorkySon while I headed to Save the Children’s office in Farringdon, where I was due to meet up with the other campaigners. The day got off to a great start when I picked up a copy of the Guardian at the station, and a story about Save the Children’s and Oxfam’s newly released report – A Dangerous Delay – was on the front cover. The report details the cost of late response to early warnings in the 2011 Drought in the Horn of Africa. More than 30 million people are still affected by the crisis, and A Dangerous Delay outlines some of the steps that can be taken to avoid a similar situation happening again. At the Save the Children Headquarters, as I sat in reception waiting to be met, there was further coverage of the report on BBC News – it looked like it was going to be dominating the morning news, which was brilliant. After everyone had arrived, there was a short breakfast meeting with some of the brilliant campaign staff, the other campaigners attending the hand-in (including Charlie Is So Cool Like, and his lovely vlogging Mum Lindsay), and Save the Children CEO Justin Forsyth who was just back in the office after an appearance on the Today Show. We had a chat about the campaign, and posed for some photos with the GIANT petition, before hopping into a cab to Downing Street. We had been due to do the hand-in at 1pm, but due to a visit from the Italian Prime Minister, we’d been bumped back to 12pm. The members of the Italian media gathered outside 10 Downing Street looked somewhat bemused by our group, walking up and down the street and posing for photos in our matching t-shirts! But they were full of questions about what we were doing, and it was great having the opportunity to talk about the 66 Cities campaign. We had only planned on handing in a small version of the petition, but as the policeman on the gate said we couldn’t take in the large version – which was supposed to just be a photo prop – unless it was handed in too, lucky old David Cameron now has a giant petition about ending extreme hunger sitting in his front hallway. (It really was big – I had to stand on tip-toes to see over the top!) I’m hoping it acts as a constant reminder to him of the need for action. We came out of the hand-in to two pieces of very exciting news. The first was that Save the Children’s Twitter takeover had been a huge success. 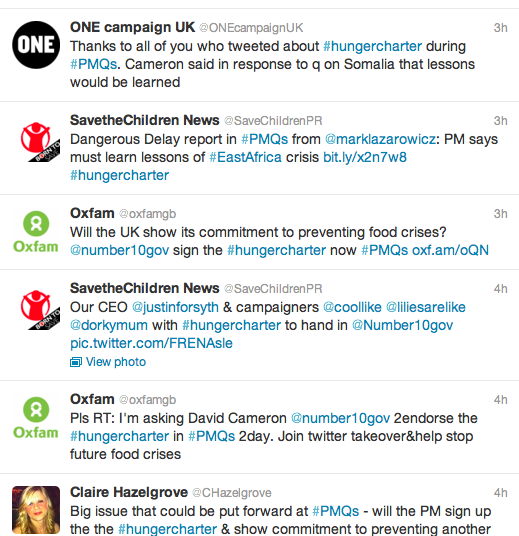 Hundreds of people had taken over the PMQs hashtag thread with messages about the Hunger Charter. In terms of raising awareness and demonstrating the breadth and depth of support for action from the Government, that was absolutely fantastic. The second huge bit of news was that the issue had actually been brought up at Prime Minister’s Questions. Mark Lazarowicz – a Labour MP from Edinburgh (hurrah!!) – spoke up and said that he was sure David Cameron would be aware of the report from international aid agencies which showed the crisis in the Horn of Africa was made worse a delay in the international response. He added that West Africa was on the verge of a similar crisis, and asked what the Government would do to ensure a speedier response. In reply, David Cameron said the UK response in East Africa had been quick, but the Horn of Africa was difficult to get aid into due to terrorist groups in Somalia. He said that he would study the report carefully, especially in terms of West Africa, and that it was important to learn any available lessons. It may have only been a short exchange, but to have the issue discussed at PMQs is an absolutely huge achievement, and one that was only made possible by all the people who emailed their MPs, wrote to their local newspapers, blogged about this, or signed the petition. Thank you so much if you were involved in the campaign – and if you weren’t then I hope you’ll maybe consider getting involved in future, because yesterday’s events serve as huge proof of the impact that campaigning can have. You really can make a difference. 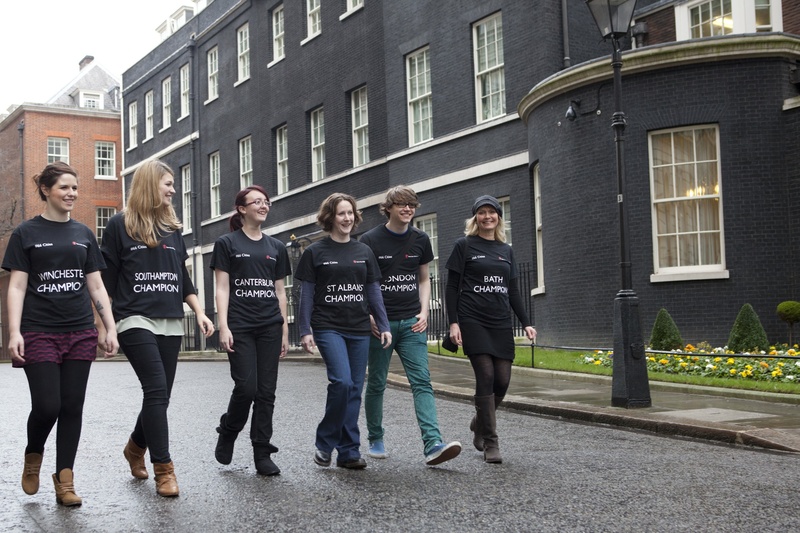 When we returned to the Save the Children offices, there was a brilliant atmosphere – the campaigns team were celebrating their success. But as we sat down and chatted over lunch, it didn’t take long before we were all talking about the next phase of the campaign, how we can follow up, and keep putting pressure on to make sure that the Government really does take action to back up its words. « DorkyMum goes to Downing Street! Oh how I WISH I could have been there Ruth. It looks great and so satisfying to be doing something so worthwhile. We’ll continue blogging and putting pressure on our politicians. This is so important, I hope Cameron follows through with action after all the talk at PMQs. How fabulous, well done you. Ashamed to say that the twitter take over went right past my head. I had no idea. Thanks for joining in with the showcase again. This sounds like a great day and a really good cause. A big Well Done to everyone involved! Thanks for letting me know about this – just joined! It’s amazing what we can achieve when we put our minds to it! Well done everyone involved!